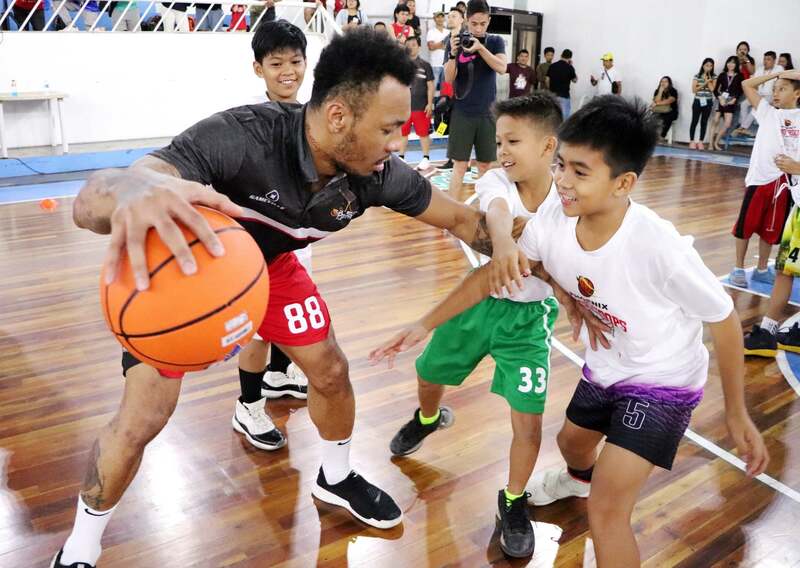 Phoenix PULSE Fuel Masters forward Calvin Abueva teaches young kids about defense during the Phoenix PULSE Fuel Masters Basketball Camp on March 15, 2019 at the Davao City Recreation Center. Phoenix PULSE Fuel Masters, the PBA team of leading independent and fastest-growing oil company Phoenix Petroleum, spent time with young basketball players during the Phoenix PULSE Fuel Masters Basketball Camp held at the Davao City Recreation Center on March 15, 2019. Phoenix PULSE Fuel Masters Alex Mallari, Matthew Wright, and Doug Kramer teach shooting techniques to the young players of the Phoenix PULSE Fuel Masters Basketball Camp in Davao City on March 15, 2019. 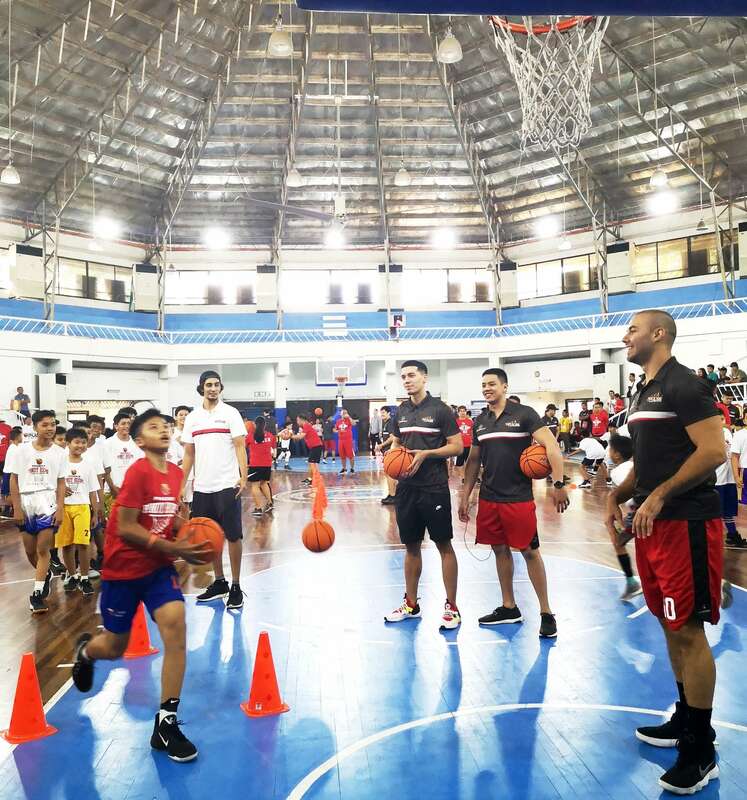 “The basketball camp is a good opportunity for the team to give back and get in touch with the kids, to teach them the basics of basketball so they can improve their game, and to inspire them to dream big,” said Phoenix PULSE Fuel Masters Team Captain Doug Kramer. Proper footwork, ball handling, shooting (fundamentals), passing, defense, and shooting (layup) were among the techniques taught to more than 100 basketball players, aged 10 to 12 years old. The participants were from Phoenix Petroleum adopted schools in Davao; Davao City Special School, Doña Asuncion Hizon Elementary School, F. Bangoy Central Elementary School, Lapu-Lapu Elementary School, San Roque Elementary School, and Vicente Hizon Elementary School. Local coaches, led by Camp Director Goldie Delvo and Camp Master Aladin Saldua, facilitated the camp. 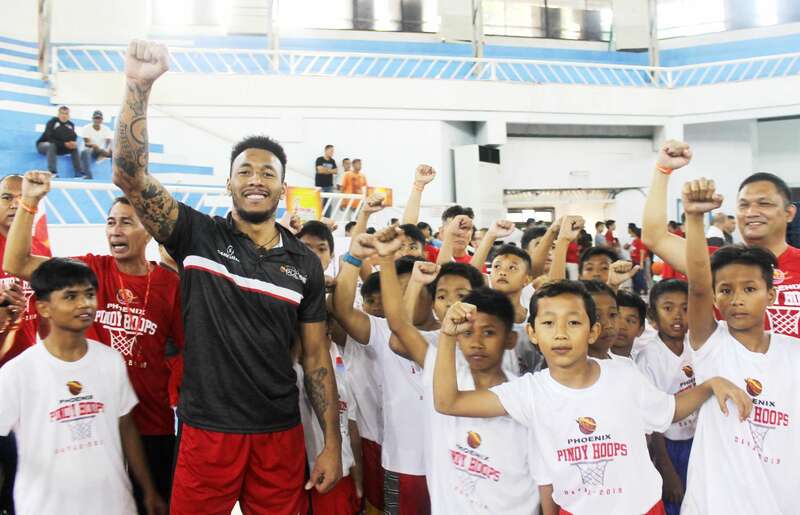 Phoenix Fuel Masters forward Calvin Abueva takes a group photo with the kids at the Phoenix PULSE Fuel Masters Basketball Camp. The Phoenix PULSE Fuel Masters guided the young players and gave them tips. Seeing the kids, guard and rookie Ron Dennison recalled his childhood. “I, too, started my career by joining basketball clinics and learning from experienced players and coaches. Now, it makes me very happy to be able to return the favor and teach these kids who are dreaming of becoming professional basketball players someday,” said Dennison. The Fuel Masters arrived in their hometown, Davao City, on March 14, 2019, for their last game in the elimination round of the 2019 PBA Philippine Cup on March 16 at the Panabo City Gym. In between practices, the team made time to meet fans and supporters. They first visited the Phoenix Petroleum Headquarters in Davao. JC Intal, Willy Wilson, Rey Guevarra, Jorey Napoles, and Michael Gamboa joined Davaoeños at the Phoenix Damosa Station for a meet and greet activity. Lastly, the Fuel Masters, in full force, participated in the basketball camp. The Phoenix PULSE Fuel Masters made its best regular season finish in the elimination round as it defeated the four-time champion San Miguel Beermen in Panabo City, Davao del Norte, bringing off a pulsating 96-93 victory. The team now officially secures the number one spot in the 2019 PBA Philippine Cup with a 9-2 win-loss record—the first and best in the team’s history. 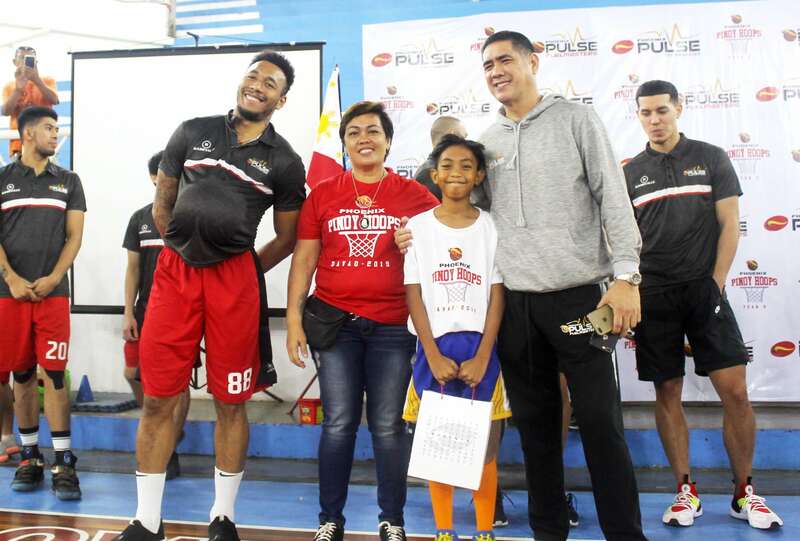 Phoenix PULSE Fuel Masters Head Coach Louie Alas, forward Calvin Abueva, and Basketball Camp Director Goldie Delvo award the camper who demonstrated best footwork techniques during the Phoenix PULSE Fuel Masters Basketball Camp.